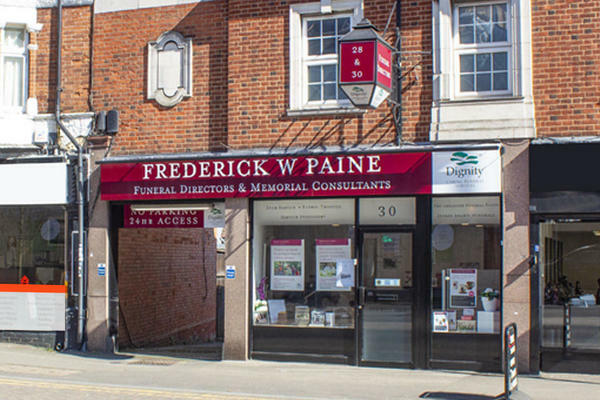 Frederick W Paine Funeral Directors in Worcester Park is here to help you by easing some of the pressure during what we understand can be a difficult time. Our team will be by your side every step of the way, guiding you carefully through any decisions and answering any questions you have. For 125 years we have been helping people from all over the South East, serving several generations of the same families who have entrusted themselves to our care, just like their family members before them. Our Worcester Park funeral home is close to the tube station on Central Road, neighbouring Old Malden, Stoneleigh, Cheam, Sutton, Tolworth and Morden. We welcome families from all communities, faiths and cultures, and our recent refurbishment means that our funeral home is a modern and comfortable place to visit whenever you should need to. We are here to talk at any time, so please reach out if you ever need us. There are two free parking bays available for half an hour outside our funeral home, or two hours free parking in Waitrose car park in Stone Place. You can find us at the top of the hill opposite Sainsbury's. Our staff are available 24 hours a day on 020 8337 1062 if you require our services outside of these hours.